Well I went out today for the 1st time this year by kind invitation of Michael Emery on his boat Kirsty III. We left Douglas harbour and headed South in search of the days Pool fish for the round £ and the species chosen by Michael was Cod with Ling as the back up species. The only bait to be used was frozen Mackie and we were both going to use our own rigs . Michael choose to use The Shakespere Pink Goblin lures(PINK DEADLIES as we call them) whilst I used my home made luminous Green Meanies . The weather was ok but there was a definite swell which kept the boat a rocking and did not give us the same drift twice. On the 2nd drift I caught a codling of about 2lbs whilst Michael caught a small Ling which swam away to live another day. 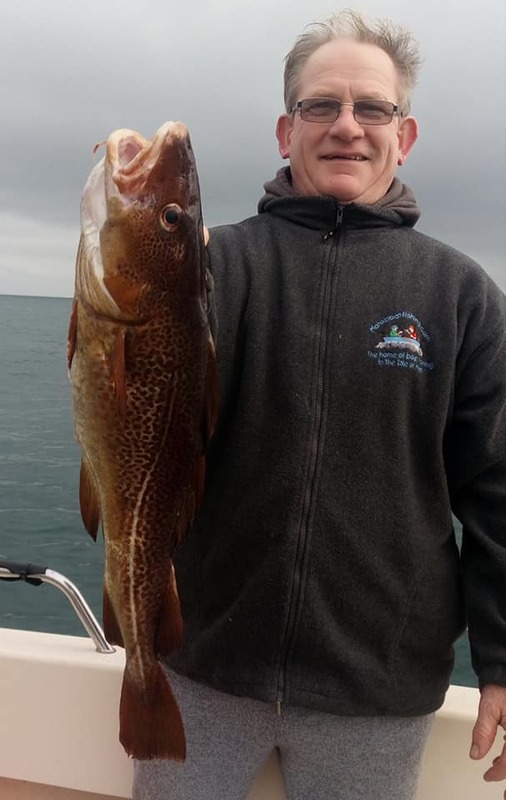 I then had a Cuckoo Wrasse and a Dog fish whilst Michael caught 2 more Ling with the heaviest touching the 7lb mark which has gone home to make Michael a fish curry. In between his two ling I got into a nice Cod of 5.5lb which by the end of todays 4hr session was good enough to take the 1st round £ of 2019. I will have to get that off Michael as he forgot to give it me when we arrived back in port. Trampie can be seen heading out behind us from Douglas and they from all accounts had a good day species hunting , but not sure of all that they caught , maybe Skipper John Maddrell will enlighten us.